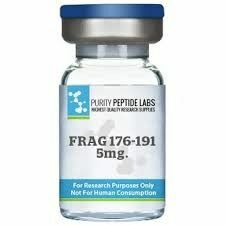 Frag 176-191 is a fragment of amino acids 176-191 of at the C-Terminous end of the hGH, human growth hormone. The small region of the GH molecule at the C-Terminal region is referred to as Frag 176-191 and is being researched for its ability to reduce adipose fat tissue. HGH Fragment 176-191, which is the abbreviation of human growth hormone 176-191, is a peptide which is used only for fat loss in the body. It works by reducing the appetite so that it prevents the weight gain and it does not directly burn the fat mass in the body. Since it does not compromise the blood glucose level, HGH Fragment 176-191 is a good alternative among the HGH injections. This medicine is very effective in increasing energy and burning the fats especially in stomach and abdominals. In addition to this, this peptide is also increases the IGF 1 level in the body which is useful for giving anti- aging effects. However, this medicine does not be used in the treatment of any illness or it does not lead to increase the muscle mass like other peptides do. This medicine has few side effects when compared with other peptides. The possible side effects of this medicine are, it may cause excessive sleeping, or just the opposite insomnia, and burning the spots of injection. However, all these side effects disappear when the users discontinue taking it for two or three days. In order to increase the effectiveness HGH Fragment 176-191, it should be taken either to empty stomach or only with protein in the stomach, because fats and carbohydrates inhibit the growth hormone releasing. For this reason, after taking this peptide, people should wait at least thirty minutes to eating. It is taken as injection into fat like stomach, thigh or buttock, or it can be taken into bicep or shoulders. Many studies have showed the fact that the HGH Fragment 176-191 is an effective treatment for obesity and fat loss, and much safer than its Human Growth Hormonecounterpart. The average dosage of the compound is 2-6 IU or (500-1000 mcg) per day split into two or three doses. Studies shows that the use of HGH Fragment 176-191 during 30 days produced a considerable reduction of body fat. In most studies no adverse side effects were reported with continuous use in the rational dosage limits.